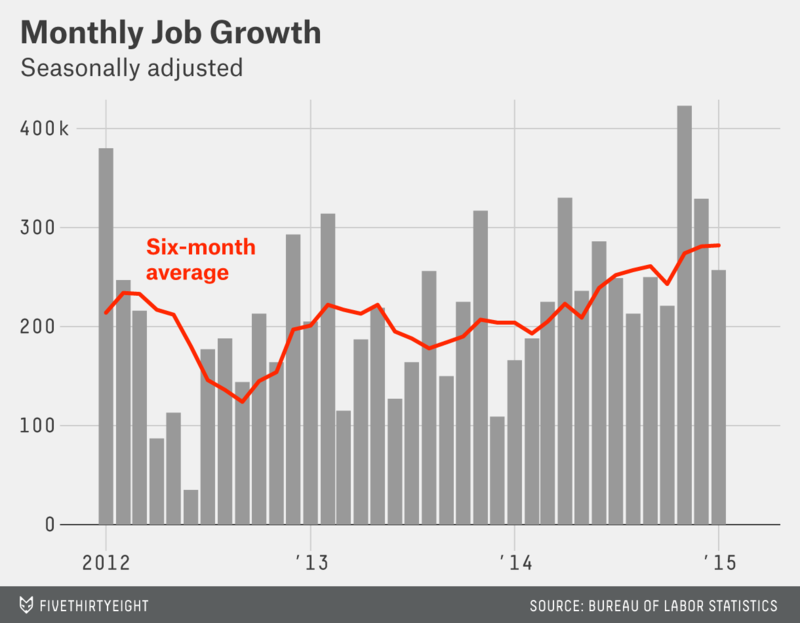 The job market started 2015 on a strong note, and 2014 was even better than initially believed. The U.S. economy added 257,000 jobs in January, the Bureau of Labor Statistics reported Friday. Taken on its own, that would represent a solid number that continues a run of strong monthly job gains. But don’t take it on its own. The real news in Friday’s report wasn’t what happened in January; it was what happened in the prior months. The BLS revised up its estimates for November and December job growth by a combined 147,000 jobs. November, in particular, went from a great month to a borderline historic one; set aside a one-month spike in hiring due to the 2010 Census, and the 423,000 jobs added in November were the most since March 2000. The elephant in the room remains: wages. 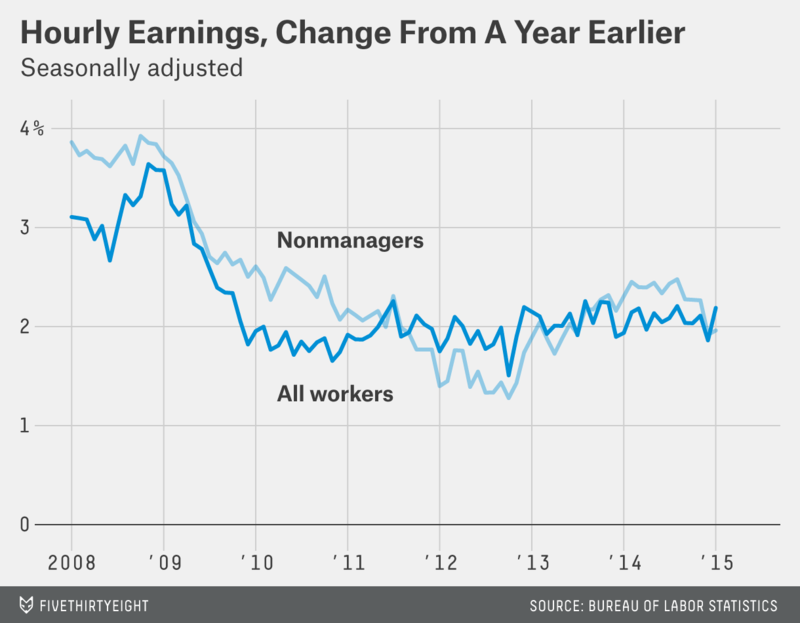 If the job market is getting so much better, then why aren’t workers getting bigger raises? Friday’s report suggests the answer might be that they are — average earnings rose by 12 cents per hour in January, the biggest one-month gain since June 2007. But month-to-month wage data is always volatile and has been particularly choppy recently, so it makes much more sense to focus on the longer-run trend. That shows little sign of an acceleration in wage growth. For all its strength, then, Friday’s jobs report did little to change the overall picture: a rapidly improving job market but one that isn’t reaching workers’ wallets. The good news is that if the recent trend in job growth continues, it should translate into wage growth eventually. Can the recent trend continue? Economic growth slowed at the end of 2014, and global trends — slowing growth in China, stagnation in Japan and a lost decade in Europe — will weigh on the U.S. But so far, at least, the American economy has proven resilient. The unemployment rate rises for “good” reasons: The unemployment rate ticked up a tenth of a percentage point to 5.7 percent in January. But that’s actually good news. As regular readers know, the unemployment rate only counts people who are actively searching for work; in January, more people came off the economy’s sidelines to look for jobs. The labor-force participation rate — the share of adults who are either working or looking for work — rose two-tenths of a point to 62.9 percent. That’s still close to a 30-year low, but the decline is due at least in part to the aging of the baby boom generation. 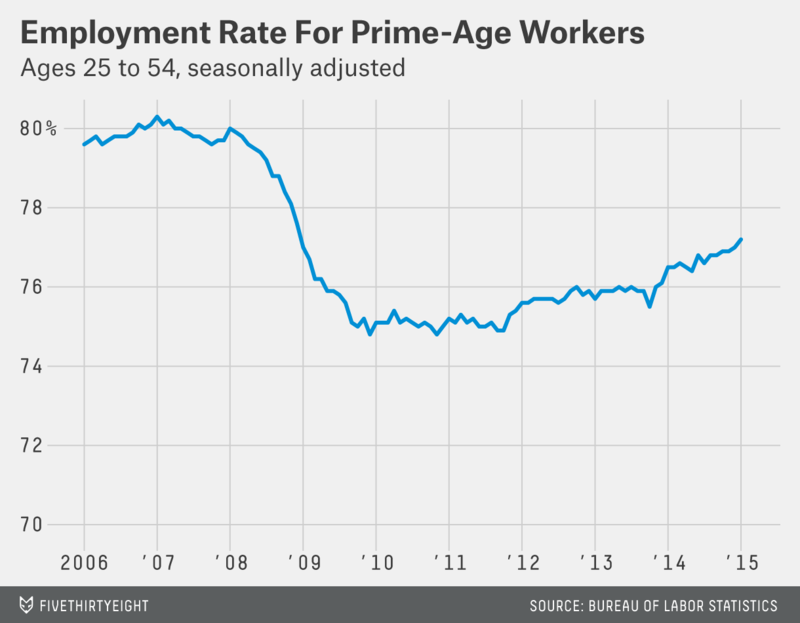 A better measure, which looks at the share of adults in their prime working years who have jobs, is rising steadily, although it, too, remains well below its prerecession level. Cheap oil hits home: The steep drop in oil prices is rippling through the economy, for good and ill. Oil and gas companies cut jobs in January as drilling activity slowed; that’s a reversal for a sector that had been an important source of job growth during the recovery. But low gas prices are putting money in consumers’ pockets, which could be helping other parts of the economy. Retailers added jobs at their fastest pace since the end of 2013, and hotels and restaurants posted strong job gains. More good jobs: Retail and hotel jobs are mostly fairly low-paying. But higher-paying sectors also showed good growth in January. The construction sector added 39,000 jobs, manufacturers added 22,000, and the professional and business services sector added 39,000. (And for once, the growth in professional and business services wasn’t driven by temporary hiring, which actually declined.) 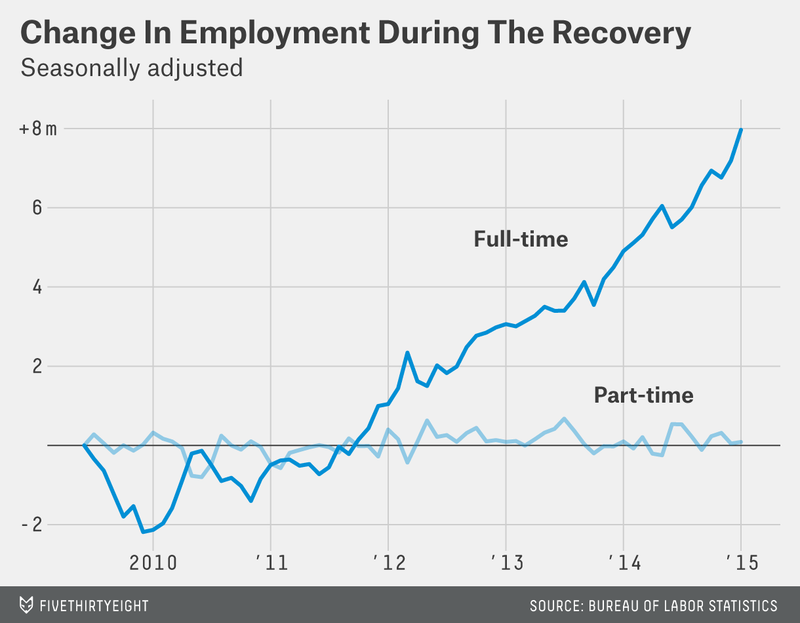 Moreover, recent job growth has been almost entirely in full-time jobs. Among those who are working part time, fewer are doing so involuntarily. Still hard for the unemployed: Despite the recent improvement in the job market, there are 2.8 million Americans who have been out of work for more than six months. That number understates the true total because it ignores those who have stopped looking for work. 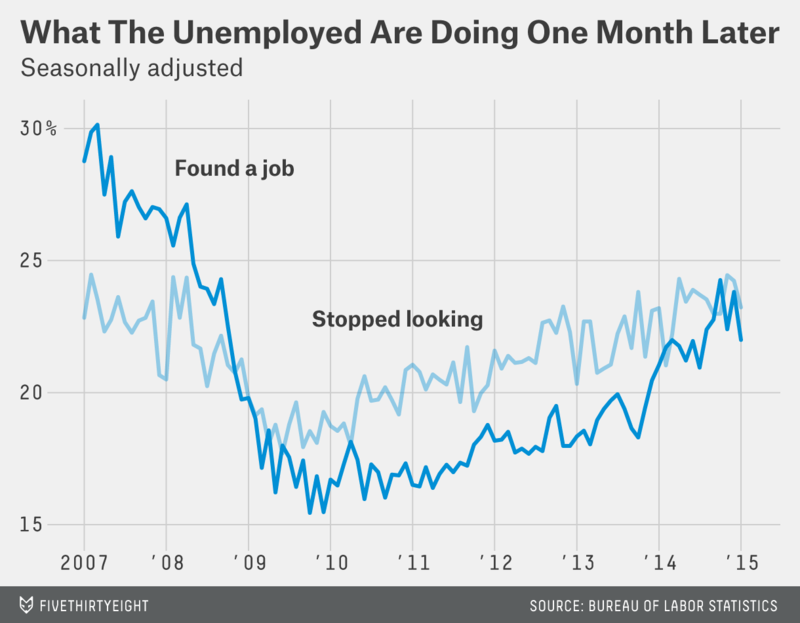 The job-finding rate — the share of the unemployed one month who are employed the next — has risen in recent months. But job seekers are still about as likely to leave the labor force as to find work. A word of caution: The monthly jobs figures are always volatile and subject to revision; recently, those revisions have mostly been positive, but there’s no guarantee that trend will continue. Economists caution that January numbers can be particularly tricky because of the big swing in employment around the holidays. And as economist Justin Wolfers noted on Twitter, there’s a possibility that last year’s terrible winter weather could have skewed the seasonal-adjustment formula, making this January look better than it was. Keep an eye on next month’s revisions.